Update: New Community Management has issued an apology and explanation of why the Oyster interview between Casablancas and Hynes appeared in reportedly abbreviated form. Read it below. 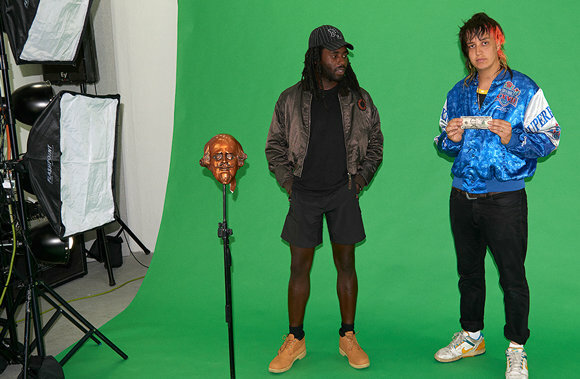 In correspondences between New Community Mgmt & Life or Death PR, we’ve come to the conclusion that the Dev Hynes / Julian Casablancas interview was inadvertantly cut off in an email that we forwarded from Cult Records to Life or Death. Which was then forwarded to Oyster Magazine, who were assured it was the full transcript. This was my mistake and want to apologize to Dev and Julian for omitting the rest of their conversation, and I’m sorry to our friends at Oyster who did not in any way censor their conversation. Update: Julian Casablancas just published the unedited transcript of his interview with Dev Hynes. Read the full thing here. Read more of their back-and-forth here, and pick up this month’s Oyster for the full chat. Also of note: a Reddit thread points out that Casablancas — after noting last fall that he’d been working on inventing a folding electric bicycle — actually filed a patent application for the device several years ago. “Often times the distance one must travel is seemingly too short or too inconvenient to ride a bus or subway or to drive a car, but too long to walk,” begins the “Background of the Invention” section. Read on here for a full description and plenty of photographs of how the bike would work.